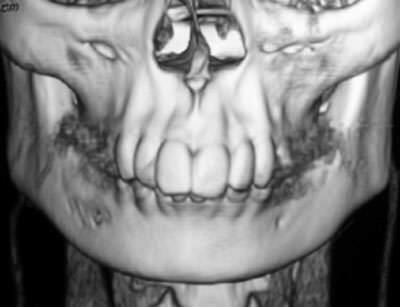 Traumatic bone cyst is a rare bone lesion often diagnosed during routine radiographic procedures carried out prior to orthodontic treatment. They are seldom detected on clinical examination because of their inability to cause cortical expansion. 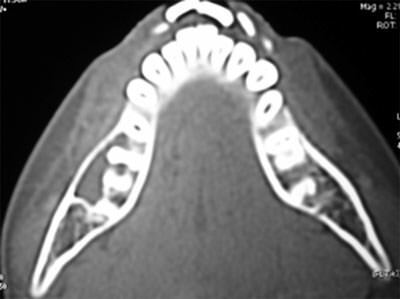 We report to you a rare case of traumatic bone cyst that was detected accidentally during radiographic investigations carried out before the commencement of orthodontic treatment. 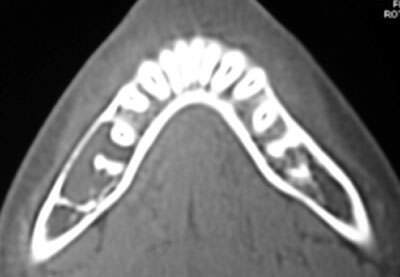 Keywords: traumatic bone cyst, orthodontic treatment, accidental radiographic finding, three-dimensional imaging. El quiste de hueso traumático es una lesión de hueso rara a menudo diagnosticada durante la rutina radiográfica procedimientos realizados antes del tratamiento ortodóncico. Ellos son rara vez descubiertos por el examen clínico debido a su inhabilidad de causar la extensión cortical. Le relatamos un caso raro del quiste de hueso traumático que fue descubierto por casualidad durante investigaciones radiográficas realizadas antes del comienzo del tratamiento ortodóncico. Palabras clave: quiste de hueso traumático, tratamiento de ortodoncia, descubrimiento de radiográfico casual, representación tridimensional. Surgical exploration has been advised not just to confirm the diagnosis but also a treatment modality. (10) Bone regeneration after surgical exploration is typical feature of TBCs. (11) Spontaneous regression of the lesion has been observed in cases of TBC. (12). The case is presented is intended to provide insight about traumatic bone cyst which is a relatively rare pathological entity. It is most commonly detected as an accidental finding during routine radiographic procedures carried out before the commencement of orthodontic treatment. Furthermore the role of three dimensional imaging in the diagnosis of such TBC is also highlighted in our case. 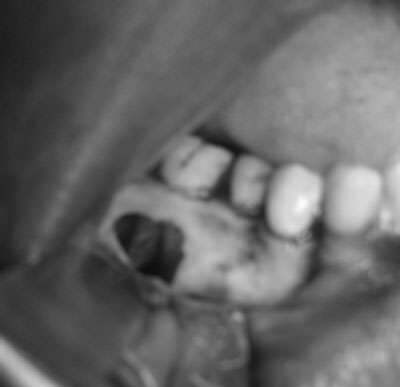 A 18-year-old female patient from Mangalore (India) reported to our clinic with complains of forwardly placed teeth. The medical history of the patient was non-contributory, patient had visited dentist on two previous occasions for scaling. Patient had a history of minor trauma to the lower jaw 2 years back but did not seek any medical attention. After a thorough clinical examination, a lateral cephalogram and an orthopantomogram were made. A well defined unilocular radiolucent area was noticed on the right side of the body of mandible (Fig. 1). The lesion extended from the root apex of the mandibular second premolar anteriorly to the mesial root surface of the second molar on the right side. Inferiorly it extended to the lower border of the mandible and superiorly it extended into the inter-radicular and interdental areas of the molars and premolars. The lamina dura appeared discontinuous in the first molar area. No evidence of external root resorption or tooth displacement was noticed. Vitality test of the teeth on the same side revealed a normal response. The lesion was provisionally diagnosed as a traumatic bone cyst. Computerized tomography (CT) of the jaws was performed which revealed buccal cortical expansion and unilocular osteolytic area on the right posterior region of the mandible (Fig.2). Buccal cortical thinning was also noticed in transverse CT section (Fig.3). A three- dimensional reconstruction CT was also made to determine the precise extension of the lesion (Fig.4 & 5). The area was surgically explored through the buccal side; hollow cavity lacking a lining was noticed (Fig.6). Bleeding was induced and the flap was sutured. Based on these clinical and radiological findings a final diagnosis of traumatic bone cyst was made. Orthopantomogram showing unilocular radiolucent area on the right side of the body of mandible. Three dimensional reconstruction shoes cortical changes around the mental foramen on the right side. The surgical exploration of the lesion was carried out and bleeding was induced because of evidence of bone regeneration after such procedure. Good healing at the site of surgical procedure was noticed after 2 weeks. The extent to which the lesion has healed will have to be determined by periodic follow-up by radiological evaluation of the site. The history of trauma to the jaws also was a crucial factor which helped us to arrive to a definitive diagnosis along with radiological features and surgical exploration. The fact that traumatic bone cyst is usually asymptomatic and detected during routine radiographic procedures makes it very important pathological entity so that it is diagnosed and treated at very early stage. Kramer IR, Pindborg JJ, Shear M. The WHO Histological Typing of Odontogenic Tumours. A commentary on the Second Edition. Cancer. 1992; 70: 2988-94. Lucas C, Blum T: Do all cysts of the jaws originate from the dental system. J Am Dent Assoc 1929; 16:659-661. Blum T: Additional report on traumatic bone cysts. Oral Surg Oral Med Oral Pathol 1955; 8(9):917-39. Baqain ZH, Jayakrishnan A, Farthing PM, Hardee P. Recurrence of a solitary bone cyst of the mandible: case report. Br J Oral Maxillofac Surg 2005; 43:333-335. Guerra ENdS, Damante JH, Janson GRP. Relação entre o tratamento ortodôntico e o diagnóstico do cisto ósseo traumático. R Dental Press Ortodon Ortop Facial. 2003; 8:41-8. Saito Y, Hoshina Y, Nagamine T, Nakajima T, Suzuki M, Hayashi T. Simple bone cyst. A clinical and histopathologic study of fifteen cases. Oral Surg Oral Med Oral Pathol. 1992; 74:487-91. Hansen LS, Sapone J, Sproat RC. Traumatic bone cysts of jaws. Oral Surg Oral Med Oral Pathol.1974; 37:899-910. Copete MA, Kawamata A, Langlais RP. 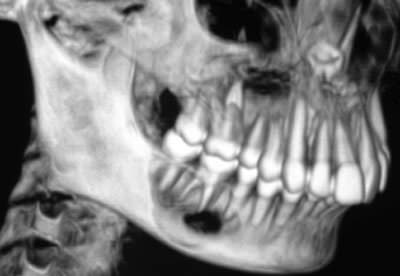 Solitary bone cyst of the jaws: radiographic review of 44 cases. Oral Surg Oral Med Oral Pathol Oral Radiol Endod. 1998; 85:221-5. Penarrocha-Diago M, Sanchis-Bielsa JM, Bonet-Marco J, Minguez-Sanz JM. Surgical treatment and follow-up of solitary bone cyst of the mandible:a report of seven cases. Br J Oral Maxillofac Surg 2001; 39:221-223. Persson G: An atypical solitary bone cyst. J Oral Maxillofac Surg 1985, 43:905-907. Sapp JP, Stark ML. Self-healing traumatic bone cysts. Oral Surg Oral Med Oral Pathol. 1990; 69: 597-602.